Recommended Retail Price: £28.99 from Primus. 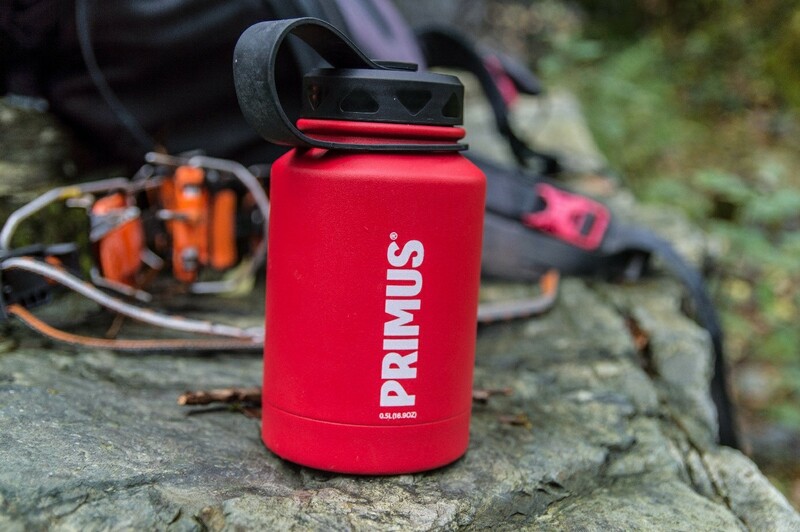 The TrailBottle Vacuum is a new series of flasks from the already extensive range offered by Primus. I have owned one of their excellent Vacuum Bottle Flasks in the past so was excited to try this new model out, particularly since I had lost my old one and was in need of a new flask as it was! The TrailBottle Vacuum comes in 2 different sizes – 0.5 L and 0.8 L – and 4 different colours – green, red, blue or black. On test is the smaller 0.5 L flask in red. 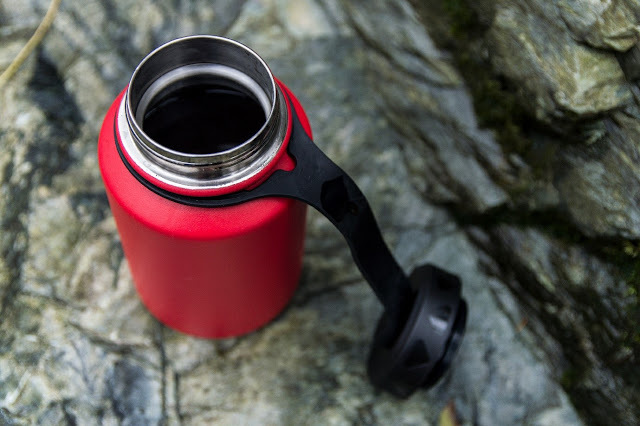 The TrailBottle Vacuum is a double-walled vacuum flask constructed from stainless steel with a powder coated outer for grip and durability. The lid is a simple screw top type, opening up to a nice wide opening. The lid is attached on with a durable rubber strap so that you won’t ever lose it. Weighing in at 340 g, it is a nice and lightweight and very simplistic. I was immediately very impressed with its size – given that my previous Vacuum Bottle flask was also 0.5 L, this flask seemed much smaller for the same capacity. I really like that it is quite short and slightly wider than normal thus making it a very good size for stuffing into my rucksack. I was however sceptical that as a result of being so small and light its heat-retaining properties would be compromised. 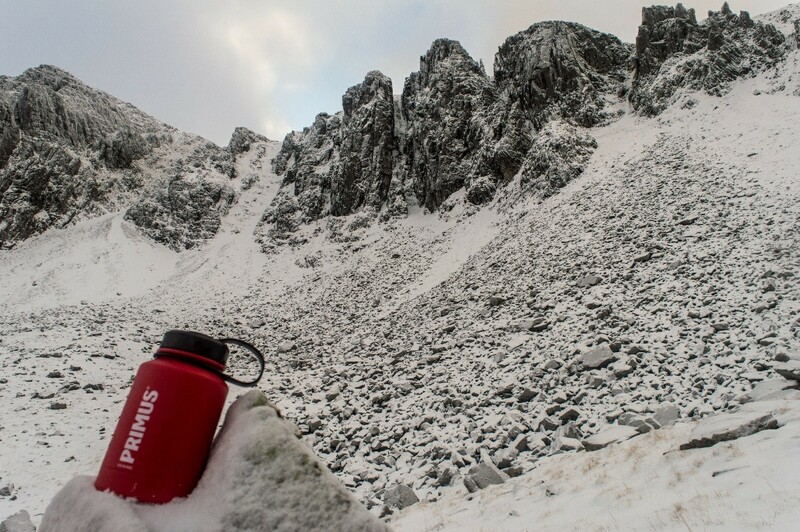 I am delighted to say that I was pleasantly surprised by the effectiveness of this flask, particularly when I took it out winter climbing and ski touring on several occasions in sub-zero temperatures all day. One day I purposefully left my flask in my rucksack all day in temperatures around -3 °C while we went off to do a route. Upon getting back to the bags about 8 or 9 hours after first filling the flask, my water bottle had ice in it, but I could have a nice hot cuppa from my flask! It, of course, wasn’t piping hot - at the end of the day there is only so much you can expect from a flask of this size – a small volume of tea or coffee can only stay hot for so long, particularly when exposed to sub-zero temperatures for an entire day sitting in my rucksack! I was nevertheless very impressed by this small flask providing me with a much-needed hot beverage after a climb. The wide lid is great – easy to drink out of and fill up, and also cleaning the inside is a much easier task than a flask with a narrow top. This should hopefully mean keeping the flask in good condition for years to come will be straightforward and hassle-free. My only gripe with this flask is the outer coating – while it claims to offer more grip than a traditional flask, I sometimes struggle to get the lid off, particularly with gloves on. I find that (especially in the cold) my gloves can’t grip the flask enough, so I usually have to take them off in order to grip the flask properly to undo the lid. It’s maybe a testament to how tight the lid is too. This isn’t a huge issue for me though, I’d much rather a tight seal keeping my tea or coffee in my flask rather than a poor quality one that is easier to undo but then leaks into my bag! Overall then, this is a great flask, not least because of its impressive ability to keep my coffee or tea hot all day (which is all I really need! ), but also it is a very handy size, simple design with no items (screw top mug) that can get lost. It is a great addition to my winter climbing and skiing arsenal and will definitely be accompanying me on all future trips to the hills or even just down to the crag. Things we like: Excellent size, keeps liquid impressively hot, easy to clean, hassle-free operation, feels tough and robust. Things we don’t like: Lid sometimes difficult to undo with gloves on, expensive.